Charlcombe is a civil parish and small village just north of Bath in the Bath and North East Somerset unitary authority, Somerset, England. The parish has a population of 422 and includes the villages of Woolley and Langridge. Charlcombe is mentioned in the Domesday Book of 1086 under the name "Cerlecume", meaning in Old English "valley of the ceorls (freemen or peasants)". Langridge and Woolley were part of the hundred of Bath Forum, while the parish of Charlcombe was part of the hundred of Hampton. From about 1720 until the early 19th century Woolley was the site of a gunpowder mill. In 1848 the village had a population of 84, and covered 523 acres (2.12 km2). Woolley is one of only 52 Thankful Villages for having lost no soldiers during World War I, and one of only 14 doubly thankful villages that also did not lose any soldiers in World War II. The parish falls within the unitary authority of Bath and North East Somerset which was created in 1996, as established by the Local Government Act 1992. It provides a single tier of local government with responsibility for almost all local government functions within its area including local planning and building control, local roads, council housing, environmental health, markets and fairs, refuse collection, recycling, cemeteries, crematoria, leisure services, parks, and tourism. It is also responsible for education, social services, libraries, main roads, public transport, Trading Standards, waste disposal and strategic planning, although fire, police and ambulance services are provided jointly with other authorities through the Avon Fire and Rescue Service, Avon and Somerset Constabulary and the Great Western Ambulance Service. 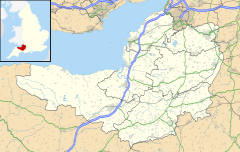 Bath and North East Somerset's area covers part of the ceremonial county of Somerset but it is administered independently of the non-metropolitan county. Its administrative headquarters is in Bath. Between 1 April 1974 and 1 April 1996, it was the Wansdyke district and the City of Bath of the county of Avon. Before 1974 that the parish was part of the Bathavon Rural District. The parish is represented in the House of Commons of the Parliament of the United Kingdom as part of North East Somerset. It elects one Member of Parliament (MP) by the first past the post system of election. It is also part of the South West England constituency of the European Parliament which elects seven MEPs using the d'Hondt method of party-list proportional representation. The local geology of the Swainswick valley around Sopers Wood, in the south Cotswolds, has been investigated because of the presence of landslides since the work of William Smith in 1799. These are caused by the over-steepened topography downslope of the cap rock formed by the Great Oolite where water egresses around the plateau at the junction between the Great Oolite and the Fuller’s Earth formation and through the more permeable limestone bands within the Fuller’s Earth. Known locally as the Woolley Valley, there has been a dispute about development of green belt land. Every year in February and March, Charlcombe Lane is closed by the local council to enable frogs and toads to cross the road in safety. During this period local residents and volunteers go out at dusk, the time of greatest movement, collecting them in buckets and depositing them on the other side of the road, allowing them to continue their journey safely towards a lake in the Charlcombe valley on a tributary of the Lam Brook. The Church of St Mary, is a very ancient stone edifice, dating from the 12th century. It is said to have been at one period the parish church of the city of Bath. It is a Grade II* listed building. There was believed to be a holy well in the grounds. According to tradition it was formerly the mother church of Bath, and received an annual acknowledgment of a pound of pepper from the abbey there. All Saints Church at Woolley dates from 1761 and was by John Wood, the Younger. It is Grade I listed. In Langridge the Church of St Mary Magdalene dates from the 12th century and has been designated by English Heritage as a Grade I listed building. The village of Charlcombe is mentioned in letters by Jane Austen as being "sweetly situated in a little green valley, as a village with such a name ought to be". ^ a b "Charlcombe Parish". Neighbourhood Statistics. Office for National Statistics. Retrieved 31 December 2013. ^ Reverend John Collinson (1791). The History and Antiquities of the County of Somerset. 1. p. 97. ISBN 978-1-171-40217-6. ^ "Somerset Hundreds". GENUKI. Retrieved 9 September 2011. ^ Buchanan, Brenda J. (2005). "Bath's Forgotten Gunpowder History: The Powder Mills at Woolley in the Eighteenth Century" (PDF). Bath History Journal. X: 72–96. Archived from the original (PDF) on 5 March 2016. ^ a b "'Charlbury — Charlwood', A Topographical Dictionary of England (1848) pp. 549–54". British History Online. Retrieved 9 February 2007. ^ Norman Thorpe, Tom Morgan (June 2005). "The Thankful Villages". Retrieved 3 January 2007. ^ Kelly, Jon (11 November 2011). "Thankful villages: The places where everyone came back from the wars". BBC News Magazine. BBC News. Retrieved 12 November 2011. ^ "Bathavon RD". A vision of Britain Through Time. University of Portsmouth. Retrieved 4 January 2014. ^ R.W.W. Anson & A.B. Hawkins (2002). "Movement of the Soper's Wood landslide on the Jurassic Fuller's Earth, Bath, England". Bulletin of Engineering Geology and the Environment. 64 (4): 325–345. doi:10.1007/s10064-002-0151-8. ISSN 1435-9529. (Print) 1435-9537 (Online). Retrieved 9 February 2007. ^ "Peter Gabriel attacks Woolley Valley farm plans". BBC. 19 May 2010. Retrieved 26 November 2011. ^ "Valentine help for love-struck toads". Bath & North East Somerset Council. Archived from the original on 20 July 2012. Retrieved 8 October 2010. ^ "Valentine help for love-struck toads". BBC Somerset News. 16 January 2006. Retrieved 9 February 2007. ^ "Church of St Mary". Images of England. Retrieved 20 November 2006. ^ "The Hermit of Charlcombe Rectory". Notes and Queries. Retrieved 9 February 2007. ^ "All Saints Church". Images of England. Retrieved 20 November 2006. ^ "St. Mary Magdalene's Church". Images of England. Retrieved 3 February 2008. ^ "Letters to her sister Cassandra Austen, 1799". Letters of Jane Austen – Brabourne Edition. Retrieved 9 February 2007. This page was last edited on 27 November 2018, at 03:43 (UTC).